Growing up on the fringe of Buffalo’s media market meant hearing the names of people and places that helped define the city in the ’60s and ’70s: Chippewa Street, Shane Brother Shane, Rocketship 7, and, of course, Bethlehem Steel. Too young to associate “Bethlehem” with anything beyond the Christmas story, it was years before I realized what it was, and even longer before I visited Bethlehem—Pennsylvania’s “Christmas City,” where the nation’s second-largest steel company was founded. These days, it’s nothing short of amazing to see the ongoing efforts that have prevented the community from petering out with the plant’s last blast furnace in 1995. Thanks to seemingly boundless collaborations, Bethlehem’s cultural and industrial history and its commitment to the arts are the foundation for growth in a city that’s home to everything from the country’s oldest bookstore to its largest free music festival. I spent two days there recently, and minutes after checking into the Historic Bethlehem Hotel, I set out on the Historic Bethlehem Walking Tour with a costumed guide in the role of “Daddy Thomas,” an early town resident. God's Acre is among the oldest cemeteries in America. Any telling of Bethlehem’s history is heavy on its founding by Moravians, a group of progressive Protestants who established a mission here. Just a block or so from the hotel are the blacksmith shop, tannery and mill that were among the 50 buildings that comprised America’s first industrial park. Up the street is the Moravian church where its trombone choir still performs in the bell tower; the Moravian Museum; the Single Sisters’ House, a women’s center created in the building that housed single women from 1744 to 2007; and God’s Acre, the cemetery. As the sun shone on leaf-strewn paths across the hallowed ground, Daddy Thomas explained that all of the flat grave markers were the same size because Moravians believe “everyone is equal in life and death.” The one interesting distinction is Stranger’s Row, where 32 Christians who were not Moravians are buried. Bethlehem was given its name on Christmas Eve 1741 by Count Nikolaus Zinzendorf in the Moravian’s Mission’s first house, built where the Historic Bethlehem Hotel now stands. When I told my aunt I’d be visiting Bethlehem, she urged me to stop at the Moravian Book Store, where she’d once bought a lamp. Unfortunately, I wasn’t able to see it at its best. The Moravian Church recently sold the store to Moravian College, and Barnes & Noble is managing it. The shop, opened in 1745, holds the college store, but much of the rest was closed for remodeling. When I met Charlene Donchez-Mowers, president of Historic Bethlehem Museums & Sites, for coffee the next day, she was optimistic that the chain will honor the store’s history, including hosting local book signings, which she’s enjoyed as the co-author of a mystery series set in Bethlehem. Numerous small shops, museums and restaurants dot historic downtown, including Tapas on Main, where making a dinner selection from all the tempting choices proved challenging. Eventually, I happily settled on Paella de la Tierra—chicken, steak and chorizo with artichokes, spinach, olives and sun-dried tomatoes. Had I arrived in Bethlehem any earlier, I definitely would have enjoyed Sunday’s Musical Brunch at Historic Hotel Bethlehem. Built on the site of Bethlehem’s first home, the hotel is elegant and vibrant with majestic Palladian windows and, just for fun, framed photos of famous guests, from Henry Ford and Shirley Temple to Winston Churchill and the Dalai Lama decorating the taproom walls. The blast furnaces provide a backdrop for performances at the annual 10-day MusikFest, which is thought to be the country’s largest free music festival. 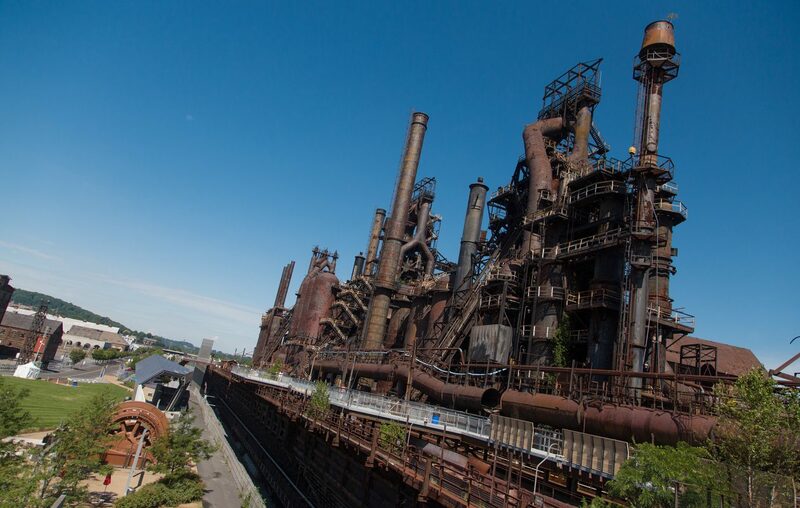 On Monday, I had lunch at The Flying Egg, then drove the short distance across the Lehigh River to South Bethlehem, home to Lehigh University, upper-crust Fountain Hill, the Banana Factory art center, and most importantly—the former Bethlehem Steel site. At its peak during World War II, more than 30,000 people worked at the 1,800-acre campus. In its new life, some of that acreage is home to the Smithsonian National Museum of Industrial History and Sands Casino Resort Bethlehem, which opened in 2009 and is about to be sold to Wind Creek Hospitality. Sands donated 10 acres to ArtsQuest, PBS, and the city of Bethlehem. The result is ArtsQuest’s SteelStacks, the $70 million arts and cultural complex near the old blast furnaces. The Bethlehem Redevelopment Authority spent about $10 million to refurbish the quarter-mile Hoover-Mason Trestle, which runs along the furnaces almost to the casino. The day I was there, it felt surreal to walk along the trestle, peering into the furnaces and reading the plant’s history on placards. Clouds, dark and pregnant with rain, lent a sense of foreboding appropriate to a place that had seen 500 workers killed in accidents over 40 years and another 1,000 or so seriously injured. Obviously, a Monday afternoon in November didn’t give me a first-hand look at all that SteelStacks means for the city’s revival. But there’s a palpable excitement and pride when talking to Burger and the folks at ArtsQuest, the non-profit that presents most of the programming at SteelStacks and Levitt Pavilion. That includes Christkindlmarkt, which runs weekends for a month (drawing 92,000 people in 2018); Lehigh Valley SoccerFest; the family-friendly New Year’s Peeps Fest; and MusikFest, the country’s largest free music festival. Curt Mosel, ArtsQuest’s chief operating officer, said the organization’s Banana Factory, about five blocks away, has 30 artists renting space and serves 30,000 children a year through ArtSmart. “We want to make the Lehigh Valley a better place to live, work and play and to attract more than 2 million people a year,” he said. It’s just one tiny measure of success, but with only a taste of what Bethlehem was, is, and will be, I’m eager to return. The steel plant that would eventually bear the Bethlehem Steel name came to Buffalo as the Lackawanna Iron and Steel Co. Already established in Pennsylvania’s Lackawanna Valley, its owners decided in 1899 to improve the company’s access to rail and water transportation and move to West Seneca, a portion of which eventually became the town of Lackawanna. It 1922, the plant was sold to Bethlehem Steel. Until its closing in 1983, it struggled with unions, foreign competition and profitability, finally being tapped for closure partly because of New York’s high taxes and state and federal air and water pollution abatement costs climbing into the millions.